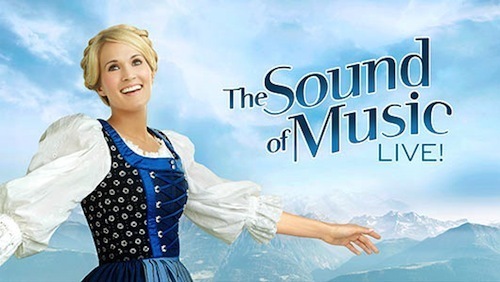 The Sound of Music Live is officially a ratings success by nearly every metric imaginable, with the records—Highest rated non-sports Thursday in the demo since ER finale! Most watched non-sports Thursday since the Frasier finale! First time NBC has won five straight nights of primetime since 2002!—flying fast as the magnitude of its success becomes clearer. I enjoyed The Sound of Music Live. It didn’t actually work as a case of storytelling, harmed by uneven performances by its two leads, but I also think that a lot of those problems were inherent to the medium in which the musical was being experienced. That Carrie Underwood and Stephen Moyer were unable to sell me on a relationship that I can imagine feeling rushed in 90% of performances of this musical is far from history’s greatest failure; instead, it’s a noble effort that created some decidedly powerful images and a few too many scenes of people speaking lines instead of expressing sentiments. Said problems were better overcome by the three musical theater veterans cast around the two leads—Audra McDonald, Laura Benanti, and Christian Borle—and on the whole I would say that I enjoyed the experience both as a social media event and as a unique and ultimately fun television program. It is also—based on reports in The Hollywood Reporter from earlier this week—likely to fail to meet all of the expectations placed on it by NBC, because I find it difficult to imagine a scenario whereby The Sound of Music Live becomes an evergreen holiday performer in the way Robert Greenblatt imagined it could. This is not because the three-hour event was bad, necessarily—as I noted on Twitter while watching, I enjoyed it, and I don’t buy the idea that it was so absolutely awful that every single person watching was doing so exclusively to snark on it. However, the element of snark highlights the ways in which this succeeded based on its status as an event of discovery, in which curiosity drove audiences more than certainty. And if NBC truly intends this to be something that they can either run again between now and Christmas, and something that could become an evergreen special that could run in subsequent years, I am not convinced that the experience is something that people would want to repeat in full after this point. Although its success could spark additional curiosity that could sustain the rerun at some point before the holiday, the experimental nature of the broadcast has created something more apt to be watched once than watched over and over again, which given the report they lost money on the ad sales from that broadcast means they may still struggle to recoup their reported $9 Million investment. By all accounts, this is how NBC imagined it working, with the DVD release on December 17th and the ad sales from subsequent airings being reported as necessary steps to the event becoming profitable for NBC. I expect that the high ratings will allow the latter to take place and let NBC to break even, but my gut says those ratings will be considerably lower, and any attempt to air this again next year is likely to be met with limited audience response. What NBC proved is that viewers are willing to come out of the woodwork for a swing-for-the-fences experiment, but we are past the point where The Sound of Music Live would be understood as a swing-for-the-fences experiment. We saw the swing, and NBC gets to sell it as a home run, but the musical itself was more of a messy inside-the-park home run marred by throwing errors than a pure swing of beauty, something that viewers will remember. It’s not simply that the musical wasn’t always a success as a televisual production, with consistent issues with sound, lighting, and the aforementioned inability for the emotional throughline of the musical to resonate. It’s also that it feels very of-the-moment, fascinating given it was a purposeful throwback to a half-century old tradition and pitched as a contemporary social media event. It felt trapped in a moment somewhere in between 1952 and 2013—friend and colleague Alyx Vesey suggested 1993—and Carrie Underwood’s casting is a big part of that problem. By casting someone who fits comfortably into the realm of “stunt casting” given her lack of musical theater experience, the musical calls attention to its status as a stunt and an experiment, whereas something that is going to become an evergreen can’t feel like it’s a stunt. It’s true that Underwood’s acting was part of the special’s limitations, but even if she had been a more natural actress this was still “Carrie Underwood stars in The Sound of Music Live,” a fact that makes it difficult to see this production outliving its brief moment in the pop culture spotlight. Instead, as many have speculated, it’s more likely NBC will craft another experiment, finding another star with an interest in musical theater who has an interest in a musical with appeal to women 18-34—the special’s highest demo—and staging another event like this one. And yet based on the economics of the special, that doesn’t necessarily seem as though it was NBC’s primary goal, and may not actually be enough to suggest that The Sound of Music Live was a breakout success. In the end, I expect soundtrack sales, DVD sales, and the curiosity factor of a second broadcast will let them break even, but I’m not sure if the data from this experiment has indicated that NBC has either an evergreen holiday hit or a repeatable pattern; instead, I expect that whatever live musical they choose to stage next will be a completely new gamble, something that NBC will do with a feather in its cap but while nonetheless knowing that the experiment could fail just as easily as it could succeed. I hope the initial ratings success inspires NBC to do another live musical, as I enjoyed getting to watch a musical with my Twitter feed and seeing some great musical theater performers get their due live in primetime. However, if they want that musical to be successful, they’ll need to recreate the feelings of curiosity and uncertainty that led people to tune in, a task that is not so easy as pointing to previous ratings performance. The Sound of Music Live may be a hit, but its ultimate success remains dependent on variables on which it is difficult to speculate based on the data available. While Audra McDonald somewhat stole the show, Laura Benanti had two of my favorite moments: her cut-to-commercial shade throwing, and her stage pro handling of one of the other actors stepping on her dress, which she made feel as though it was scripted. It should be noted that I’m fairly certain I’ve never seen The Sound of Music all the way through, which may have colored my response to the musical as a whole. I can’t remember where I read it — probably AVClub — but I think the major problem here was lack of live audience. I’m in the target demographic and I’ve almost worn out DVDs of concert recordings of things like Sweeney Todd. So where was the orchestra? Where was the audience? Where were the sweeping shots of applause and laughter on the faces of actual people happy to be there? Live theatre without an audience falls flat to me.